The Peer Review: Summer Fun! Last Saturday we went to my brother's house for the afternoon. 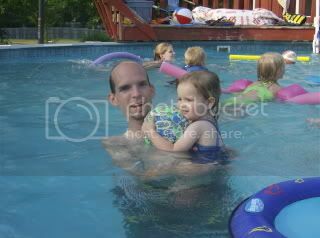 He has a swimming pool, and the kids had a great time swimming. Caleb took swimming lessons during the winter, so he got to show off some of his skills. He can't quite swim yet, but at least he's not afraid of the water like he was last year. 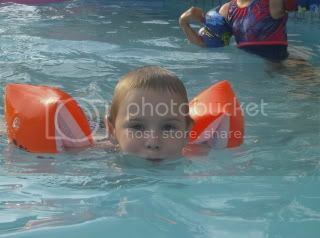 Caleb practicing holding his breath underwater. 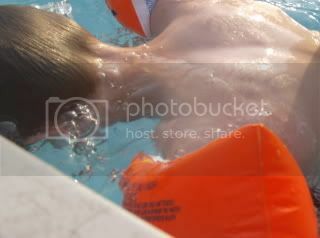 When we put a life jacket on Rachel, it would flip her unto her back. 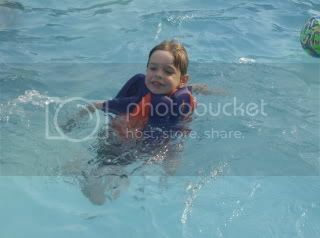 My SIL had this little floatie thing, and she loved it. Jada and Aaron. Jada loved playing with the ball. 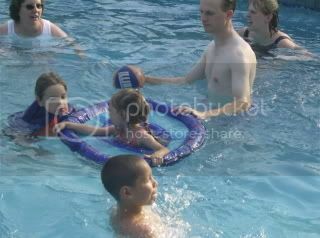 Aaron would lift her up to the basket ball hoop (which hung out over the pool) and "dunk" it. She thought it was so funny!! It was a wonderful, sun-filled afternoon!